The Royal Society was founded in 1660 by a group of natural philosophers who had met originally in the mid-1640s to discuss the ideas of Francis Bacon. They decided to found a ‘Colledge for the Promoting of Physico-Mathematicall Experimentall Learning’ and in 1661 received the royal patronage of Charles II. A Royal Charter followed in 1662. 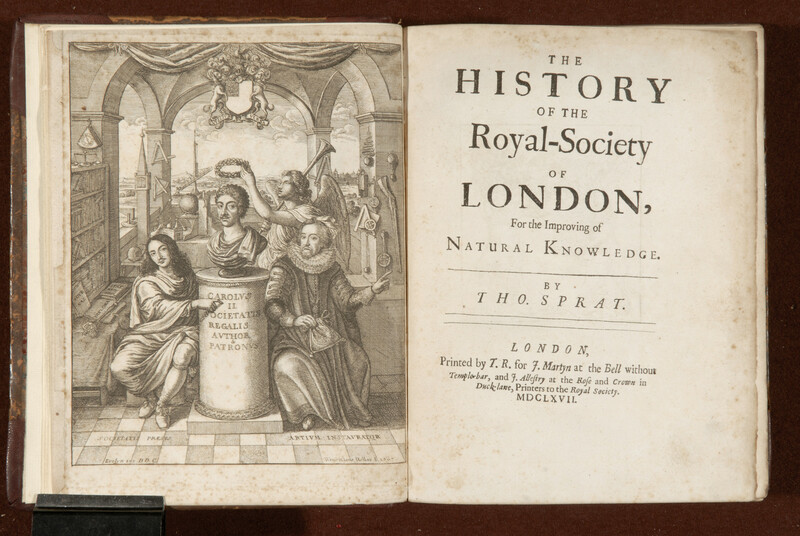 In 1663 the Royal Society began considering the publication of a history of the society in order to broadcast their intentions to a wider audience. Thomas Sprat, a protégé of Royal Society Fellow John Wilkins, was chosen to write the work. It was first published in 1667, with a magnificent frontispiece designed by John Evelyn and etched by Wenceslas Hollar, showing a bust of Charles II flanked by Francis Bacon on the right, and on the left by William, 2nd Viscount Brouncker, the first President of the Society. Francis Bacon is regarded as the pioneer of scientific method, and his emphasis on experiment and investigation was the foundation of the Royal Society's principles. Charles II (1630-85) granted the Society a royal charter in 1662; ever since then the reigning monarch has been the patron. The Society had varied interests, from the nature of gravity to investigating whether a spider could be captured within a circle of ground unicorn’s horns. Uppermost in their concerns, however, was that knowledge be gained from observation and experiment, rather than from preconceived theories. The Royal Society has been described as laying the foundations of the modern world.